Australia have competed in all eight Rugby World Cups, winning the final on two occasions and also finishing as runner-up twice. In 1991 Australia beat England in the final at Twickenham and won again in 1999 at the Millennium Stadium in Cardiff when their opponents in the final were France. Australia's first international match was played against the touring British Isles team in 1899. The first Test was played at the Sydney Cricket Ground and won 13–3 by Australia, but the tourists won the remaining three Tests. The Australian team for the first match consisted of six players from Queensland and nine from New South Wales. The team wore the blue of New South Wales when playing in Sydney and the maroon of Queensland when playing in Brisbane, but with an Australian Coat of Arms in place of the usual emblems of each colony. The first Test between Australia and New Zealand was played at the Sydney Cricket Ground in 1903, with New Zealand winning 22–3. This tour improved rugby's popularity in Sydney and Brisbane and helped to boost club match attendances. In 1907 the New South Wales Rugby League was formed and star player Dally Messenger left rugby union for the rival code. The next year the first Australian rugby team to tour the British Isles left Sydney. Newspapers in England initially gave the team the name 'Rabbits'. The Australian players thought this nickname derogatory and replaced it with 'Wallabies'. In Queensland regular competitions did not commence again until 1929, and there was no official Australian team selected through most of the 1920s before the 1929 All Blacks tour. 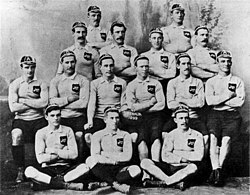 The New South Wales Waratahs were re-formed in 1920, however, and played regularly throughout the decade including series of matches against New Zealand and South Africa before their 1927–28 tour of the British Isles, France and Canada. Because these Waratahs teams were Australia's only representatives at the time, all international matches they played during this period were accorded retrospective Wallaby status. War hero Sir Edward "Weary" Dunlop also played for Australia before World War II. He played on the side that was the first to win the Bledisloe Cup. The first Test to following World War Two was played at Carisbrook, Dunedin between Australia and New Zealand in 1946, which New Zealand won 31–8. Australia did not win on the three match tour; beaten 20–0 by New Zealand Maori, and then losing 14–10 to the All Blacks the following week. Australia embarked on a tour of the home nations in 1947–48. The successful tour fell short of an undefeated run when the Australia lost to France in their last match, in Paris. Players on the rise included Trevor Allan, Cyril Burke and Nicholas Shehadie. John Moulton was the Wallabies team doctor during the 1986 Bledisloe Cup win in New Zealand and the Rugby World Cup in 1987 and the Rugby World Cup victory in 1991. After not retaining the Tri-Nations in 2002, and losing the Bledisloe Cup in 2003 Australia made a strong start to their 2003 World Cup campaign with a 24–8 win over Argentina, and two large victories over Namibia and Romania. They then narrowly defeated Ireland 17–16 and Scotland 33–16, in the quarter-final. They claimed one of their greatest victories over New Zealand when they upset them in the semi-final winning 22–10, prompting George Gregan to taunt the New Zealanders with the words "Four more years boys, four more years". They played England in a thrilling final and were finally beaten after England's Jonny Wilkinson kicked a drop goal in extra time. 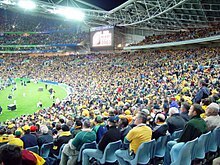 Australia also won their first match against Italy in the 2011 Rugby World Cup, but lost their second 2011 World Cup match, 6–15 against Ireland. Injuries to crucial players Digby Ioane and Stephen Moore influenced the results, alongside poor line-out throwing. In their third Pool C match, against the United States, the Wallabies eventually won 67–5, with Rob Horne, Rocky Elsom, Kurtley Beale, Drew Mitchell, Pat McCabe and Radike Samo all scoring a try, while Anthony Fainga'a scored 2 and Adam Ashley-Cooper scored three. The Wallabies won their last pool match against Russia, 68–22. The Wallabies beat the Springboks 11–9 to progress into the semi-finals. However a week later the Wallabies were knocked out of the 2011 World Cup after being defeated 6–20 by the All Blacks in the second Semi Final match. They then faced Wales in the bronze medal final, narrowly winning 18-21. Following the Wallabies defeat to the British and Irish Lions in their 2013 tour, and with a winning rate of 58.1%, a poor 3-15 record against the All Blacks, Deans came under increasing pressure to keep his coaching position. On July 2013, Deans resigned, ending his six-year tenure as head coach of the Wallabies. During his tenure, Deans coached the Wallabies on 74 occasions winning 43 times, losing 29 and drawing twice. He had won just 3 times against their main rivals, the All Blacks, with 1 draw in 2012. However, he left with a good record against the Springboks, with 9 wins from 14. Highlights during his tenure as coach included leading the Wallabies to a Tri Nations championship in 2011 and to a 3rd-place finish in the 2011 Rugby World Cup. On 9 July 2013, Queensland Reds coach Ewen McKenzie was officially named Wallabies coach to replace Robbie Deans. McKenzie's first match in charge was a 47–29 loss to New Zealand in the opening fixture of the 2013 Rugby Championship. In this match he gave 5 debutants their first cap. The 27–16 loss a week later, meant the Bledisloe Cup would stay with New Zealand for the 11th year in a row. In addition to this, McKenzie led to team to a 38–12 loss to South Africa, the biggest ever winning margin by South Africa over Australia in Australia. The 14–13 win over Argentina was McKenzie's first victory as an international coach, but the scoreless second half was the first time Australia had failed to score points in the second half since the home test v New Zealand in 2005. Australia's poor form in the Championship continued against South Africa, where Australia lost 28–8 in Cape Town. However, Australia's final fixture of the Championship saw the Wallabies earn their first bonus point win in the Championship and saw them score the most points in either the Rugby Championship / Tri Nations. During the Championship, McKenzie made several bold moves as a coach. He dropped star player Will Genia for Nic White, who at the time had only 3 caps, and named Ben Mowen as captain in his first year as a test player. On 18 October 2014, McKenzie resigned as the head coach of Australia. He left the Wallabies with 11 wins in 22 tests coached, for a winning percentage of just 50%. McKenzie left with a good winning record against European opposition, winning 7 of 8 tests played, the lone loss coming against England in November 2013. He also left with a good winning record against Argentina, with a 3-1 win-loss record. However, he left with a poor record against Rugby Championship opponents, failing to win a match against New Zealand and leaving with a 1-3 win-loss record against South Africa. On 22 October 2014, New South Wales Waratahs head coach Michael Cheika was appointed the new head coach of Australia, becoming Australia's third head coach in 2 years. In his first match as coach of Australia, Australia defeated the Barbarians 40-36 at Twickenham Stadium. In 2015 it was time for the Rugby World Cup. Australia was in "the pool of death" alongside Wales, Fiji, England and Uruguay. The Wallabies first match was against Fiji which Australia won 28 - 13. 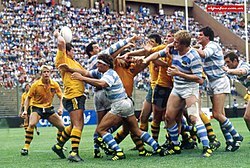 Then Australia slaughtered Uruguay 65 - 3. In the third round Australia defeated England at Twickenham 33 - 13, eliminating the host nation from their own World Cup. In the last pool match Australia luckily defeated Wales 15 - 6. In the Quarter finals they scraped a controversial win over Scotland by 35 - 34. They then defeated Argentina in the Semi finals which took them to the Grand Final against New Zealand, which they lost 34 - 17. 2018 was one of the worst years ever for Australian rugby. In the June series against Ireland, Australia won the first test 18-9, but lost the remaining matches 21-26 and 20-16 despite outscoring the Six Nations Grand Slam holders by five tries to three. The home series loss to Ireland was Australia's first since 1979. In that year's Rugby Championship Australia again lost both matches against arch-rivals New Zealand. Although they secured a hard-fought 23-18 victory against South Africa in Round 2, they subsequently lost to Argentina at home for the first time since 1983, as well as the return fixture to South Africa 23-12. Their third win of the year was against Argentina where, despite losing the first half 31-7, the Wallabies pulled off an astonishing second-half comeback to win the match 45-34. In the final Bledisloe test, played at Yokohama stadium in Japan, the Wallabies were again trounced by New Zealand 37-20. That autumn, Australia suffered their first defeat to Wales in 10 years by 9-6. The scoreline of the Welsh game, as well as the result, exactly mirrored that of the first meeting between the sides 110 years earlier. They defeated Italy 26-7 the following week, before falling to a sixth defeat to England by 37-18 the week after. The Wallabies finished 2018 having won only four games from thirteen tests played, marking that year as their direst run of results in the professional era, and their worst calendar year since 1958. The Wallabies play in Australia's traditional sporting colours of green and yellow. 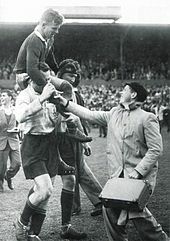 Before there was a national jersey in place, the Wallabies would play in the jersey of the state the game was being held. The Australian Coat of Arms would often replace the state logo on the jersey, and a variety of these colours were used in a number of matches in the early 1900s. In 1928 governing bodies agreed that "the Australian amateur representative colours of green and yellow, should be adopted". The following year the All Blacks came to Australia, and the jersey worn was emerald green with the Australian Coat of Arms; with green socks with bars on the top. The jersey remained mainly the same, with a few variations, throughout the 1930s. Canterbury's design for Australia's 2007 World cup jersey was controversial, featuring a curved tan-coloured panel across the chest resembling the shape of a bra. This led the Sydney Morning Herald's chief rugby correspondent to include a satirical piece in his column comparing it to Kramer and Frank Costanza's infamous man bra from Seinfeld. In 2010, KooGa became the apparel sponsor. The first KooGa jersey for the Wallabies under KooGa was used from 2010 through to the conclusion of the 2012 season, however, a different set of shorts and socks were made for the 2012 season. A new kit designed by KooGa was revealed in 2013 for the series against the British and Irish Lions. BLK Sport, previously the Australian subdivision of KooGa, became the apparel sponsor after that tour, with the BLK logo replacing the KooGa logo on the kit for the 2013 Spring Tour. ^ Sponsored logos appear on jerseys for matches other than the Rugby World Cup where branding, except for logos of equipment manufacturers, is not allowed. ^ BLK brand apparel was supplied for the 2013 end-of-year tour. ^ Worn in the first test v. Great Britain on 4 June 1899. From then on, Australia tended to use the colours of the state they were playing in, in this case, the light blue of New South Wales. ^ Worn in the second test v. Great Britain at Brisbane. From then on, Australia tended to use the colours of the state they were playing in, in this case, the maroon of Queensland. ^ Worn v. the All Blacks in 1907. It returned as a change kit in a series v. the Springboks in 1937. ^ Worn during the 1908-09 tour of Great Britain. It was revived in the tour of South Africa and Rhodesia in 1933, and also for tours of New Zealand in 1936 and 1946. ^ Worn during a series v. the All Blacks in 1929, 1931 and 1932. ^ The now traditional gold jersey was introduced in the 1961 tour of South Africa to avoid confusion with the Springboks jersey. The nickname "Wallabies" is in reference to the wallaby—a marsupial that is widely distributed throughout Australia. The name has its origins during first United Kingdom and North America tour by the Australian team in 1908. New Zealand had just completed a tour and the English press dubbed their team the "All Blacks". It was suggested that Australia should too have a nickname, and Rabbits was one of the names suggested by the English newspapers. The Australians rejected this, and did not want the national team to be represented by an imported pest. They opted for the native Wallaby instead. 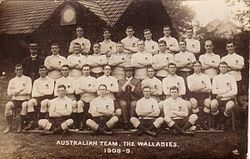 At first it was only touring parties that were nicknamed the Wallabies; when Australia played domestically, they were referred to as internationals. When the World Rankings were introduced in 2003, Australia was ranked fourth. Since then, the highest ranking Australia has achieved is second, and the lowest is seventh. Up until 2015, to be selected for the Wallabies, eligible players had to play for an Australian Super Rugby franchise, and eligible players playing outside of Australia were not able to be selected. On 16 April 2015, it was announced that the ARU would tweak their selection policy, so that certain players could ply their trade in the Japanese Top League competition from August to February, as long as they continued to play for a Super Rugby franchise from February to August, making them eligible for Wallaby selection as they would also be still playing in Australia. However, this "flexible contract" would only be given to a select number of players considered by the head coach and the ARU board, which means not all players playing or transferring to Japan would be allowed to play in the Top League and the Super Rugby. As the Top League competition clashes with some Wallaby test matches, Wallaby selectors would use World Rugby's regulation 9 (clubs must release players within international windows) to select these players when the Top League clashes with the Rugby Championship in August through to October, and the end-of-year tour in November. At this point, players playing in Europe were not considered for the flexible contract, as too much of the European season clashes with Wallaby test matches. However, on 22 April 2015, further changes were made to the original selection policy in order for some European based players to be selected. In addition to the flexible contract, Australian players playing anywhere in the world can be selected for the Wallabies as long as they fit a certain criteria - A player must have held a professional contract with Australian rugby for at least seven years, and have played 60 tests or more for an overseas based player to be selected. Further more, if a player does not fit this criteria and plays overseas, but chooses to return to Australia, they become immediately eligible for selection as long as they have signed at least 2 years with the Australian Super Rugby franchise for the following season. Like the flexible contract, Wallaby selectors would use World Rugby's regulation 9 to select overseas based players anywhere in the world. On 29 October, Micheal Cheika named a 34-man squad for the 2018 Spring tour. On 3 November, Jed Holloway and Brandon Paenga-Amosa dropped out of the squad, and were replaced by Tatafu Polota-Nau and Isi Naisarani. As of August 2018[update], the Wallabies have fourteen former players (and two former coaches) in the World Rugby Hall of Fame, which was previously known as the IRB Hall of Fame prior to 2015. The two World Cup-winning captains, John Eales and Nick Farr-Jones, were among the first Australians to be inducted. Eales received this honour in 2007. Farr-Jones and another former Wallaby captain, Nick Shehadie, were inducted in 2011. Shehadie was honoured not as a player but recognised, together with fellow Australian Rugby administrator Roger Vanderfield, as one of four key figures in the creation of the Rugby World Cup. World Cup-winning coaches Bob Dwyer and Rod Macqueen were also inducted in 2011. Six former Wallaby greats with combined playing careers spanning almost nine decades – Tom Lawton Snr, John Thornett, Ken Catchpole, Mark Ella, David Campese and George Gregan – were added to the list of Australians in the IRB Hall of Fame in 2013. Lawton, a fly-half whose international career spanned from 1920 to 1932, was noted for his ball-handling and kicking skills, and most notably led Australia to their first-ever clean sweep of the Bledisloe Cup series, in 1929. Thornett, a forward who played in four different positions for the Wallabies, made his international debut in 1955. He earned 35 caps in a 12-year Test career, and captained the Wallabies 15 times. During Australia's drawn 1963 Test series against South Africa, in which he served as captain, the Wallabies became the first team in the 20th century to win consecutive Tests over the Springboks. A further two World Cup winners, Michael Lynagh and Tim Horan, were inducted in 2014 and 2015 respectively when the separate New Zealand-based International Rugby Hall of Fame was merged with the IRB's Hall of Fame. Wallabies and Olympic gold medallists from the 1908 tour of the United Kingdom, Tom Richards and Daniel Carroll, were honoured with inductions in 2015 and 2016. Both of these men went on to become dual internationals in rugby with Richards playing for the 1910 British Lions and Carroll winning further Olympic gold playing for United States in 1920. Both men also received awards for gallantry during their military service in World War I.
Fly-half Stephen Larkham, a World Cup winner in 1999 and renowned for his drop goal to beat South Africa in the semifinal of that tournament, was admitted to the World Rugby Hall of Fame in 2018. Prior to 1962, Australia did not select coaches as long-term appointments. Managers were appointed to handle the logistics of overseas tours and the assistant manager often doubled as the coach for the duration of the trip. Sometimes the team captain filled the Australian coaching role, particularly for home tests since the IRB had ruled that home teams could not be assembled until three days before a test match. In April 2015, BMW Australia became the official partner of the Australian Rugby Union (ARU). Signed as the official vehicle partner, two-year deal that extends until the end of 2016 establishes BMW Australia as sponsors for the Wallabies and the ARU. The partnership agreement extends BMW's involvement with the game globally, having an established relationship with the English Rugby Football Union as a vehicle partner since 2012. ^ "World Cup 1991". London: BBC Sport. 18 November 2003. Retrieved 21 May 2007. ^ "1899 – Australia". lionsrugby.com. Archived from the original on 27 September 2007. Retrieved 25 July 2007. ^ "The English Footballers. England v. Australia". The Sydney Morning Herald. 24 June 1899. Retrieved 24 December 2013. ^ "History of the Australian Jersey". Australian Rugby Union. Archived from the original on 14 October 2013. Retrieved 24 December 2013. ^ "The New Zealand Footballers: Match Against Australia". The Sydney Morning Herald. 17 August 1903. p. 7. Retrieved 16 September 2015. ^ a b "History". Australian Rugby. Archived from the original on 3 July 2011. Retrieved 16 September 2015. ^ "Australian rugby". bbc.co.uk. Retrieved 5 August 2006. ^ Fagan, Sean. "Club Histories – New Speculations". Archived from the original on 21 October 2006. Retrieved 25 July 2007. ^ "278th All Black Game". rugbymuseum.co.nz. Archived from the original on 14 June 2011. ^ "Sir Nicholas Shehadie AC OBE". Australian Rugby Union. Archived from the original on 1 February 2008. Retrieved 22 May 2007. ^ "All set for World Cup semis". worldcupweb.com. 14 November 2003. Archived from the original on 11 November 2006. Retrieved 15 November 2006. ^ "The Wallabies still have a quarter final spot to earn: Deans - thetelegraph.com.au". ^ "Rugby World Cup - All Blacks out-muscle Wallabies,... - Stuff.co.nz". ^ "BBC Sport - Rugby Union - Rugby World Cup 2011: Wales 18-21 Australia - as it happened". ^ "Australia coach Robbie Deans resigns following Lions defeat". BBC Sport. ^ "Robbie Deans steps down as Wallabies coach". ^ ABC News. "Australian Rugby Union confirms Robbie Deans 'stood down' from Wallabies job on Monday". ABC. News. Retrieved 9 July 2013. ^ "All Blacks put Wallabies to the sword". ESPN scrum. ^ "All Blacks retain Bledisloe Cup". ESPN scrum. ^ "Springboks embarrass Wallabies". ESPN scrum. ^ "Wallabies finally win under Ewen McKenzie". ESPN scrum. ^ "Springboks too good for Australia". ESPN scrum. ^ "All Blacks score last gasp win over Wallabies in Bledisloe Cup; Ewen McKenzie resigns". ABC News. ^ ESPN Staff. "Australia: Ewen McKenzie resigns from Wallabies role - Live Rugby News - ESPN Scrum". ESPN scrum. ^ "Wallabies beat Barbarians 40-36 to kick off European Rugby Tour and Michael Cheika's tenure". ABC News. ^ "Wallabies hang on to beat Barbarians at Twickenham to start Michael Cheika's tenure with a win". The Sydney Morning Herald. ^ "Bernard Foley leads Wallabies to tight win against Wales". The Sydney Morning Herald. ^ "Wallabies post 10th straight win over Wales with 33-28 triumph at Millennium Stadium". ABC News. ^ a b "Wallabies fall to lowest-ever ranking of sixth ahead of Rugby World Cup". Australian Broadcasting Company. Retrieved 17 March 2015. ^ a b c d e "History of the Australian Jersey". Australian Rugby Union. Archived from the original on 7 August 2007. Retrieved 14 August 2007. ^ "The Wallabies New World Cup Jersey...ouch..." rucksandrolls.com. 25 June 2007. Archived from the original on 27 June 2007. Retrieved 26 July 2007. ^ Growden, Greg (13 July 2007). "Just one big Boks of contradictions". rugbyheaven.smh.com.au. Archived from the original on 15 July 2007. Retrieved 26 July 2007. ^ "KooGa appointed apparel sponsor for Qantas Wallabies from 2010". Australian Rugby Union. Archived from the original on 30 October 2009. Retrieved 28 November 2009. ^ a b c d "A brief history". Australian Rugby Union. Archived from the original on 14 August 2007. Retrieved 14 August 2007. ^ "International Teams > Australia > Teams Played". rugbydata.com. 26 May 2007. Retrieved 26 May 2007. ^ "ARU allows senior overseas-based players to be considered for Wallabies". 22 April 2015. ^ "ARU will select overseas-based players for Wallabies and World Cup - Fox Sports". www.foxsports.com.au. ^ Rugby News Service (21 October 2007). "Habana named IRB Player of the Year". International Rugby Board. Archived from the original on 23 October 2007. Retrieved 21 October 2007. ^ a b "RWC legends inducted into IRB Hall of Fame" (Press release). International Rugby Board. 26 October 2011. Archived from the original on 27 October 2011. Retrieved 13 March 2012. ^ "Legends inducted into IRB Hall of Fame" (Press release). International Rugbhy Board. 18 November 2013. Archived from the original on 3 December 2013. Retrieved 1 December 2013. ^ "IRB Hall of Fame 2013 Induction: "The British & Irish Lions and Australia"" (PDF). International Rugby Board. Archived from the original (PDF) on 29 October 2013. Retrieved 2 December 2013. ^ "Rugby greats to join definitive Hall of Fame" (Press release). International Rugby Board. 31 July 2014. Archived from the original on 12 August 2014. Retrieved 10 August 2014. ^ "Richards, Thomas James (Tom) (1882 - 1935)". www.adb.online.anu.edu.au. Retrieved 29 October 2010. ^ Zavos, Spiro (8 August 2008). "Dan Carroll: rugby's greatest Olympian". TheRoar.com.au. ^ Tiernan, Eamonn (11 August 2018). "Wallabies great Stephen Larkham reflects on Hall of Fame induction". The Sydney Morning Herald. Archived from the original on 12 August 2018. Retrieved 12 August 2018. ^ Sheek (10 August 2011). "Wallabies coaches since 1962: Part I". The Roar. Archived from the original on 4 March 2016. Retrieved 19 January 2015. ^ Sheek (10 August 2011). "Wallabies coaches since 1962: Part II". The Roar. Archived from the original on 29 August 2012. Retrieved 19 January 2015. ^ "ARU signs BMW as official partner". www.rugby.com.au. Retrieved 21 September 2015. ^ "BMW Australia". bmw.com.au. Archived from the original on 4 October 2015. Retrieved 2015-09-21. Wikimedia Commons has media related to Australia national rugby union team.